The GA-HQ April 2017 Art Challenge Submissions: Bubble Bobble by Xaby83! 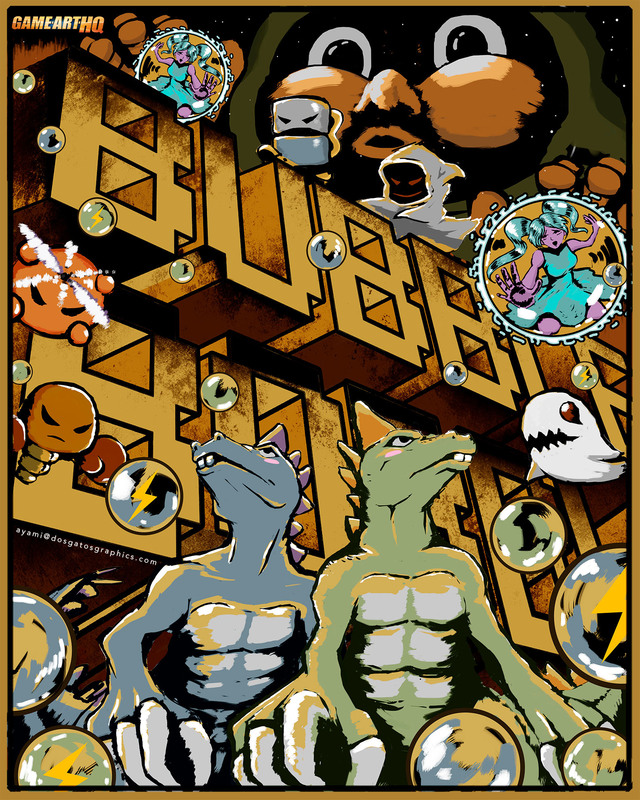 Bubble Bobble was one of the oldest games that were available for our art challenge in April/May 2017 and it was unexpected that someone would take the challenge to illustrate this great Retro Game from the eighties but Xaby83 did an amazing job to give the game and its two protagonists Bub and Bob as well as many of their enemies and the main antagonist Grumple Grommit a really accurate spotlight. As someone who played this game on the Game Boy and later the original Arcade Version I am really glad that one of our art challenges would result in a new and awesome fan art for this – sadly – almost forgotten game of the past. Taito, the game company behind the Bubble Bobble games was bought by Square-Enix a few years ago btw. The last game in the long running series was Bubble Bobble Plus / Neo, a remake of the original game released in 2009 for WiiWare. It was a great remake and while its graphics were nothing to talk about, it captured the fun gameplay and enhanced it. You can find a good couple of interesting and some really funny artworks in Ayami’s gallery there on dA, I recommend to have a look at it here!